Okay so three things about the above. 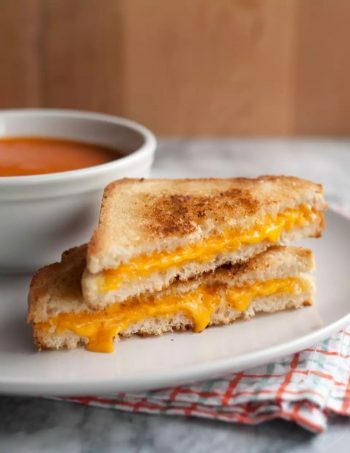 I’ve always called the sandwich made with two slices of bread, a bit of butter on the bread (or not) with extra sharp cheddar cheese in between the bread then put on a heated pan with butter (yes, must be butter) and then toasted to perfection, Toasted Cheese. I never thought about this until a few years ago AC and I were editing a book together. I had written Toasted Cheese Sandwiches and he looked at me like I was out of my mind. So we’ve had this ongoing debate about the correct name of this sandwich of extra sharp cheddar between two slices of bread toasted in butter. He tells me they are correctly called Grilled Cheese Sandwiches. Maybe it’s because he’s from Mid-Western Iowa stock. We were visiting my friend Katharine who lives near the Angel of the North (Google that—incredible!) in Gateshead, Tyne and Wear, England.For some reason the three of us talked about those sandwiches. Guess what she calls them, and with no prompting from me! Toasted Cheese Sandwiches! Toasted Cheese Sandwiches with tomato and red pepper soup is one of my favorite dinners. I love it so much I have had a few heroines and a hero or two in several different books make this dinner for someone they love. One heroine actually made her own fresh tomato soup. She also made her Toasted Cheese Sandwich with Mull of Kintyre Cheddar cheese that has crunchy salt crystals speckled through it. She cleverly added thin slices of fresh tomatoes in the sandwiches. Yummy. So, Toasted Cheese or Grilled Cheese?